The next few months I’m sewing along with Kenneth D. King. 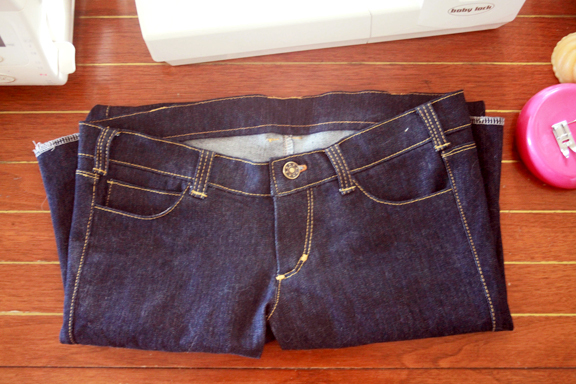 A bunch of other talented seamsters and I have joined up to learn how to recreate our favorite jeans using Kenneth D. King’s Jean-ius class on Craftsy. This post marks my completion of the class. I’m so happy to say that the jeans are now finished and living in my friend’s closet. I think they’ve already even been worn out a couple of times in the few days she’s had them. I’d say that’s a success! If you want to see them in all of their glory, head over to the Mood Sewing Network where they’re being showcased today or come back here tomorrow. This week’s final class was all about the finishing details. We tackled the waistband, belt loops, and hem. Everything went swimmingly until I had my friend try on the jeans so that we could mark the hem. The waist gapped like you wouldn’t believe! Back when I was first drafting the pattern, I remember that the back yoke piece didn’t match up with the back leg piece. The back yoke was about a half inch too short. To err on the side of caution, I added a half inch to the back yoke piece instead of subtracting from the back leg piece. It turns out I should have subtracted. Anyway, the problem was easily solved by taking a giant wedge out of the back center near the waistband. I just unpicked the back center seam and remarked a new seam that removed a few inches at the waist and then tapered down to nothing before the curve in the back crotch seam. Thankfully, the back center belt loop covered the seam that had to be added to the waistband to accommodate the fitting. No one will be the wiser! All in all, I would highly recommend this class. I liked Kenneth’s method of teaching, I learned quite a lot (not only about making pants, but also about copying a favorite ready-to-wear garment), and I was able to successfully make a friend a new pair of jeans. Thank you, Kenneth D. King, for a wonderful class! If you’re interested in taking this class yourself, follow this link for 40% off Jean-ius: Reverse Engineer Your Favorite Fit with Kenneth D. King. Congratulations on finishing the jeans! They look great. Your jeans look great! I have to ask, the waistband buttonhole, do you have any tricks? I struggle getting a decent one there. These look fantastic!! Great job, girl! The turned out great! Your friend is so lucky.